Writing Slope Decrease Back, Neck And Eye Strain. The Write Angle writing slope can decrease back, neck and eye strain by providing an ergonomic reading and writing space for you. It provides a reading/writing angle of 20°, the optimum angle for correct posture, comfort and ease of use.that is sloped towards you. This allows you to work at a comfortable upright sitting position instead of the more traditional, potentially problematic position of leaning over your desk. 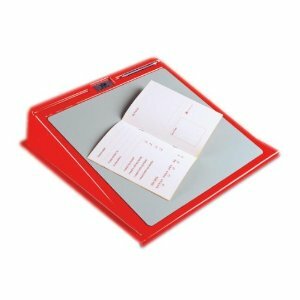 Using the Write Angle writing slope can improve handwriting, and also be more comfortable for people with limited dexterity. Ideal for children and adults. Ideal around the home for study, and recreation. I suffer with neck problems, and this device enables me to read in comfort in the right position so I don\'t get any pain, as recommended to me by my osteopath.